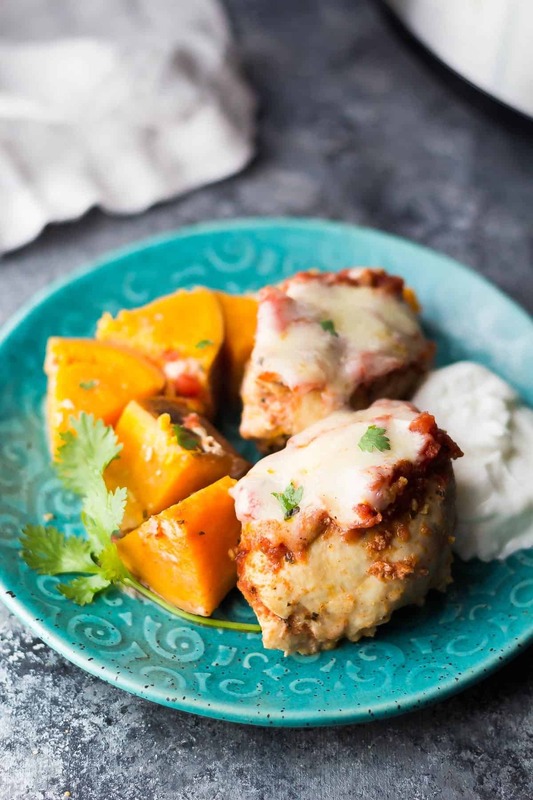 These Southwestern crockpot chicken thighs cook over sweet potatoes and are topped with a 4-ingredient spiced tomato sauce. Add some bell peppers on top for the last hour of cooking and you’ll have your entire meal ready! Happy Thursday, friends, or as I like to call it, Thur-Friday. We are heading off on an awesome adventure to Tofino (on Vancouver Island) this weekend in honor of my Mom’s 29th birthday (right mom?). I’m so excited to visit Tofino as it has been on my must-visit list for a LONG time now, and it will be so much fun for Kai to play on the beach all weekend! So between laundry and packing and toddler-wrangling and work, I need an easy dinner…actually I think by the time Thursday rolls around we are all in need of an easy dinner! 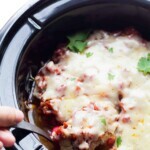 So today’s (ridiculously easy) Southwestern crockpot chicken thighs are great for all of us! These photos are slightly misleading because you can’t see what is hiding under the chicken thighs: a whole lot of sweet potatoes. The chicken and sweet potatoes are topped with a diced tomato ‘sauce’. You could totally use salsa if you have that on hand. I cooked these up for 4 hours, then smothered with some mozzarella and served them in a tortilla but they’d also be great over rice. For our first batch, we added in some bell peppers, corn and red onion for the last hour of cooking. They get soft, but still have some texture to them, and are really delicious in this recipe! For the photos, I kept it simple and left the veggies out, but I highly recommend adding the extra veggies. We loved eating everything wrapped up in tortillas, and it was super easy to clean up after! 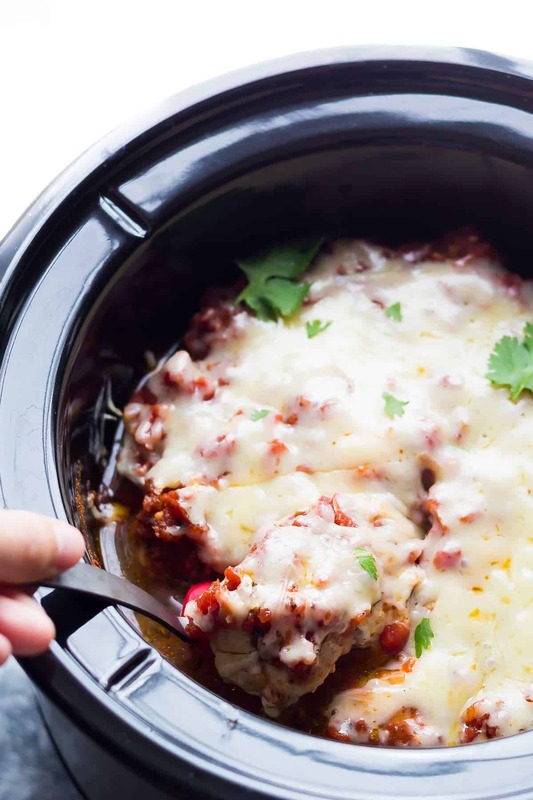 I was really pleasantly surprised by the delicious flavors in this Southwestern crockpot chicken thighs recipe considering how simple it is to throw together. The sauce is simply diced tomatoes, cumin, chili powder and salt. I thought it was going to need more ‘pizzazz’ but it was quite pizzazzy on its own! It did end up having extra liquid in the slow cooker from the juices of the tomatoes, but we just scooped the tomatoes out and left the liquid in the slow cooker. Yes. Easy dinners = more mental space left in my brain. Because I need allllll the mental space I can get right now! Happy Thursday friends. Have a wonderful weekend! 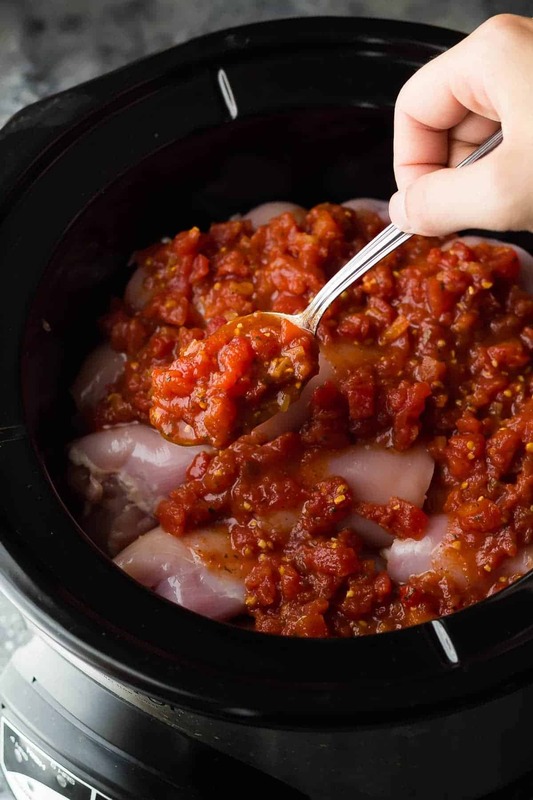 These Southwestern crockpot chicken thighs cook over sweet potatoes and are topped with a 4-ingredient spiced tomato sauce. Add some bell peppers on top for the last hour of cooking and you'll have your entire meal ready! 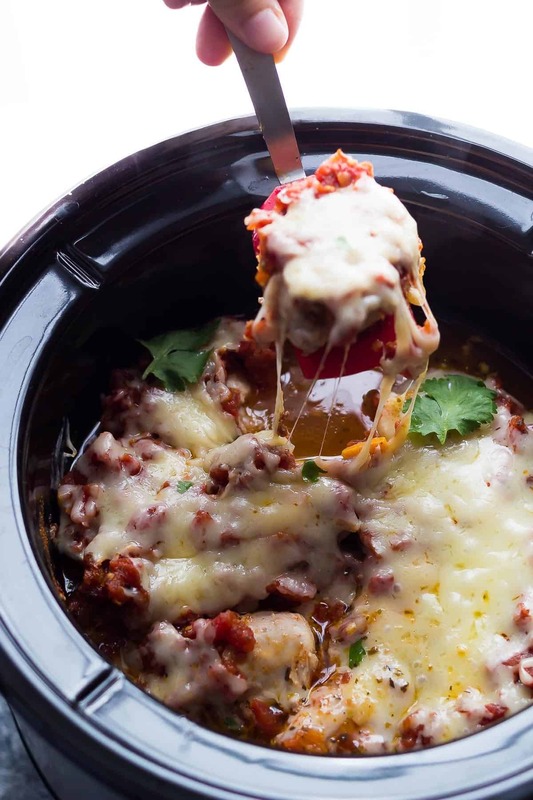 Place sweet potato chunks in the bottom of a 5-quart slow cooker. Arrange chicken thighs on top. Stir together the diced tomatoes, cumin, chili powder and salt. Spread over the chicken. OptionalDuring the last hour of cooking, scatter the corn, bell peppers, and red onion over the chicken. Min Before ServingScatter the cheese over the chicken/veggies, cover and heat until cheese is melted through. ServeOver rice, in tortillas or as is. Can I use chicken breast instead? If so, how would I adjust the cooking time? Hi Gail, I haven’t tried with chicken breasts but I think they’d work just fine. 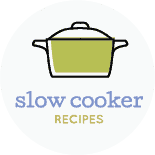 I think the same cook time would work well, unless your slow cooker cooks hot, I’d start checking around 3 hours? Hope you enjoy! 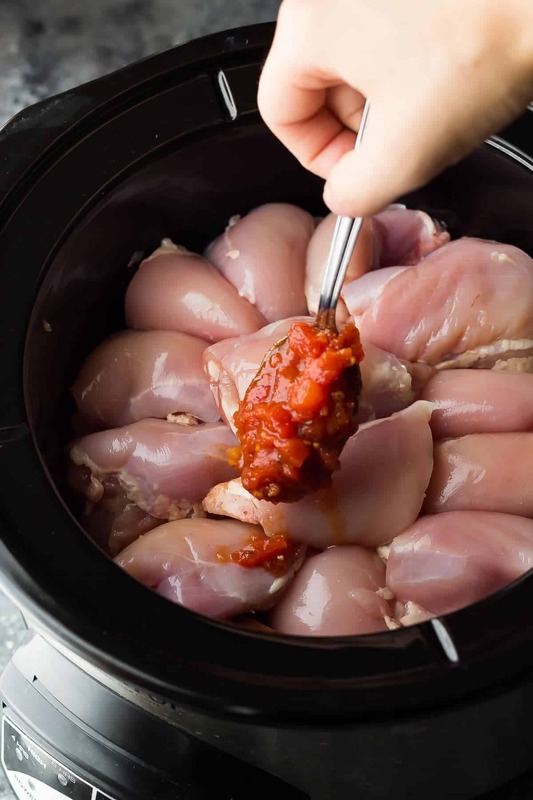 What is the approximate weight on the chicken thighs? I can’t get “small” thighs. 12 thighs would end up weighing like 4-5 pounds. Hi Laura! They were really small. I can get my scale out tomorrow and give you a more precise answer but according to google, maybe around 3 oz each? 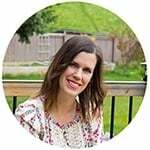 I haven’t run across any of your wonderful recipes that show nutritional info. Am I missing that or is that something you you prefer not to include? I found my recipe 🙂 totally trying this soon! Have so fun in Tofino, Denise. Thanks Rachel! I hope your dad likes them 🙂 Tofino was awesome….I already want to go back!